Ecofan - Find Eco fan stockists through the UK distributor. CALFIRE are the official UK Distributor for Eco fans. The Caframo Ecofans are a range of heat powered stove fans designed to circulate the warm air created by a wood or specialist stove. These fans do not use any batteries or mains electricity. The Caframo Ecofan 800 Original, 810 UltrAir and 812 AirMax and 815 Original Mini are heat powered stove fans designed to circulate the warm air created by a wood-stove. The optimal running temperature of these wood-stove Ecofans is between 85°C and 345°C. The Caframo Ecofan 806 BelAir is a heat powered stove fan designed to circulate the warm air created by the lower stovetop temperatures found on many Gas, Pellet or Contemporary Stoves. BelAir Ecofans operate at temperatures between 75°C and 200°C. Improved warm air circulation results in greater comfort and less fuel consumption. Testing carried out in collaboration with a leading Canadian university has proven that using an Ecofan results in fuel savings of up to 18%. Ecofans have a thermoelectric module which acts as a small generator to power the fan's motor. When this generator experiences a heat differential between its top and bottom surfaces, it pumps out electricity. The bottom surface of the module is heated by the base of the fan while the top of the module is kept cooler by the fan's top cooling fins. Warm air is circulated directly into the living area rather than having most of your stove's heat rise immediately to the ceiling, thereby increasing the heating efficency of your stove. The unique anodised gold, nickel or black coloured blade has been specifically designed to deliver a very broad cross section of gentle air movement instead of a small cone of concentrated air. Ecofans start automatically and adjust speed with the stove temperature. As the stove heats up the Ecofan runs faster to move more air into the room. As the stove burns down and cools the Ecofan automatically shuts off. Ecofans use only the heat from your stove. The Ecofan is the most economical way to effectively circulate warm air. It does not plug in, uses no batteries and can be used where there is no electricity. Ecofans are made from anodised aluminium that will not rust. It is important to read, and follow, the instructions on the correct placement of the Ecofans to ensure satisfactory long term use and that your stove is working within the temperature range of 'best operation'. We recommend the associated use of our Stove & Stovepipe Thermometer as shown below. The 812 AirMax replaced the 802 AirPlus in October 2011. The newer model offers better performance over a wide range of stove temperatures, delivering between 15 and 90% more air flow. The 810 UltrAir replaced the 800 Original in September 2012. The newer model offers better performance over a wide range of stove temperatures, delivering between 15 and 90% more air flow. The 800 Original was replaced by the 810 UltrAir in September 2012. It was re-introduced into the range in 2014 as an entry level unit to compete against Chinese copies of this design. The 815 Original Mini was introduced into the range in 2018 as a low height option for use when the space between your stovetop and the underside of your inglenook precludes the use of other Ecofan options. All the quality and performance you've come to expect, in a smaller profile. At just 165mm tall, it's perfect for small spaces. The 806 BelAir replaced the 806 GS in October 2013. The 806 BelAir is designed for use on the lower stovetop temperatures created by many gas, pellet and contemporary stoves. 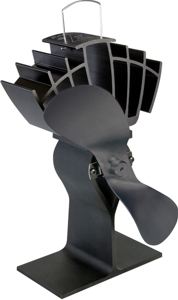 It outperforms all other Ecofans in its operating range but must not be used on a wood-stove. Size: Base 162x61mm (6.4x2.4"). Height 241mm (9.5") - from base to top of blade. The replacement kits comprises a new motor, an Allen/hex key to remove the blade and full instructions. NOTE: You have to be able to solder if you are replacing a SOLDERED motor. The replacement kits comprises a new motor, an Allen/hex key to remove the blade and full instructions. Ensure your stove is operating at the correct temperature by using this magnetic thermometer that sits on your stovetop. If your stove is too cold then creosote deposits will form, if its too hot then you are wasting both energy and money. The white area shows the optimal stove operating temperature. This unit is not calibrated for use on a Stovepipe. The JOI Lamp uses the same thermoelectric technology as the Ecofan to transform the energy of a tea light candle into powerful LED lighting. The JOI Lamp is able to convert the heat of the tea light candle into more than 100 times the light generated by the candle itself. With its telescopic extendable lamp head, the JOI allows you to create an ambient glow on your table or direct light from 430mm (17") above the housing of the unit, and everywhere in between. Manufactured from Stainless Steel the JOI Lamp is supplied with a 1 year warranty. Select 'Bigger Picture' to see the JOI Lamp extended.